← KMS Revamped Classes Poll – Results! October – Resistance, Aran, and Evan revamp. 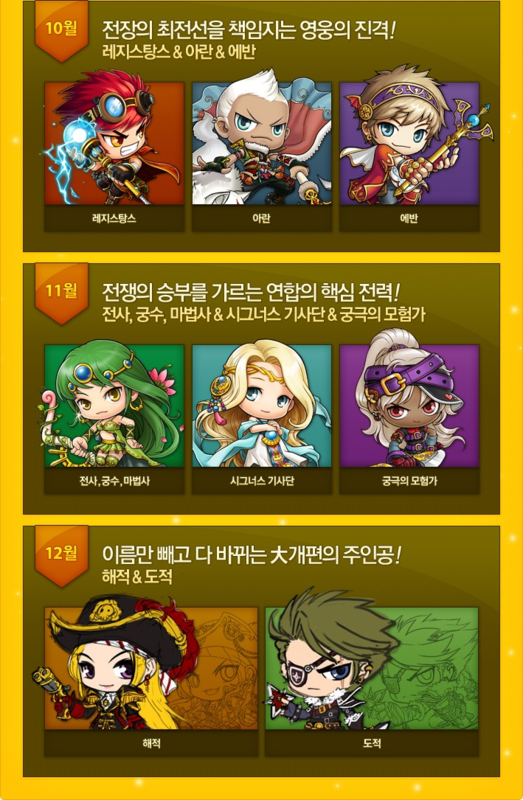 November – Warriors/Mages/Archers, Cygnus Knights, and Ultimate Explorer revamp. December – Pirate and Thief revamp. It’s all official, the revamps will be coming really soon! The signups for the 4th term of KMST are up. Follow these instructions except the URL, go to http://maplestory.nexon.com/MapleStory/Page/Gnx.aspx?URL=News/NoticeBoard&maskPageType=2&oidArticle=84493. Those revamps will be coming up in the 4th term of KMST :). Pirate and Thief revamp will come last but at least we know it will come for sure. P.S. – Updated my Sports Event post with the second part. P.P.S. – Guild BBS was updated. Not my video, credit to uploader. Paste ANY HTML codes and view it. If you want to post a YouTube video, for example, you’d go to the video on the internet, click on ‘Share’, click on ‘Embed’, and finally paste it into your Guild BBS. Navigate to any website you want if someone links you. Hope I get in this time. It can, revamp means to make equal to other classes, so they can debuff if too powerful. Maybe they would debuff archers a little because they’re kind of overpowered, but mages and warriors are ok.
would cannon shooters get buffed? cause i heard the three new classes from legend won’t get buffed, but it seems like cannon shooters will be the worst class if they aren’t buffed since everyone else is buffed. Welll to some ppl this could be the first time hearing about it. I know I don’t have the luxury of time to spend looking at other sites. I just plop in here every night before bed to check up news then I go to sleep. That’s all the time I got. But I understand where your getting at. Not 2 days… I posted this around 13 hours it was posted on the official website (sucky time zone, I know). i think the dates are wrong becouse october 10th is already past and no revamps came that recenly…. It says MONTH 10 (October), not October 10th. I hope I win this time! Good luck shakar! nice shakar, you might have come as good as me now! same thing with the max thing too. This guy thinks he’s funny. Shakar, can post the changes for sperm shooter? get a life first and then he’ll post it. I get it, I know I’m late (due to many reasons, such as having no computer/iPod for the past few weeks, a lot of school stuff to do, or my bad time zone) and I understand that you’re fine with that and I appreciate that. why are you posting about him being late? Really, just because he made a blog isn’t a reason to lose his life for it. I know you didn’t mean this but it’s bad people throw everything in one person shoulders. when is it coming out in KMST? MERCEDES, DEMON SLLAYER! Bow down to the old jobs! Ore you could just gtfo? I agree with davyjonesx. You don’t have to follow this blog, so there’s no reason for you to be here if you’re only going to be a nuisance. Besides, shakar posts about the GMS stuff that Max does not, so it’s not like there isn’t a reason people follow this blog. hey sharkar check this out what is it? Sir, we all know you aren’t Max from OrangeMushroom. You might as well give up trying to intimidate shakar with your gay efforts. is this everyone gona get revamp, if yes how about db? is db gona revamp too? So Arans and Evans, which JUST got a revamp, are getting another? I… I don’t understand. Is that why this article was posted yesterday? hey shakar i am not trying to hate i loveeeee your blog quite a lot and i am pretty sure this has been out at least 3 days or 2 maybe time has been going way to quickly for me… sorry if i came out offending…. Why does it look like the last two pictures were drawn with less effort/not properly finished o__o. Anyways, thanks for the update, I can’t wait for the Pirate revamp. Who cares if he was a little late. One more thing, if GMS is getting the Cygnus Knights, and Ultimate Explorer revamp , will we get thePirate and Thief revamp update next month? Also after that patch is in, in the same mounth will the thief hero come out?